Christmas is coming! December 3 will be the first Sunday of Advent. 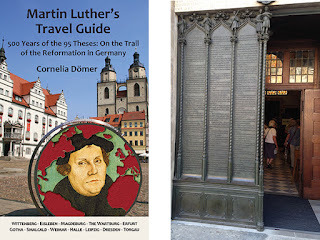 And in the spirit of the holidays, we are offering a limited number of discounted copies of Martin Luther's Travel Guide, by Cornelia Doemer, with a preface by Professor Robert Kolb. The book takes you to Lutherland, the German landscape where the Reformation took place 500 years ago; to Leipzig, Torgau, Dresden, and the historic town of Wittenberg, where Martin Luther nailed his 95 Theses to the door of the Castle Church (see below). The book usually retails for $13.99, but for a limited time, it is $12 ony — including shipping and handling (within the United States). It is first come, first serve, when they are gone, they are gone, so don't hesitate!